In Roman times, soldiers used unique crests on shields to identify military units on the field of battle. It seems fitting, then, that the Catholic Church uses such “coats of arms” to identify dioceses of the Church Militant—the soldiers of Christ on Earth. Symbolism abounds in coats of arms. Colors, the number of certain items, the presence or absence of particular elements—all combine to identify who presides over a particular ecclesial region. As Cardinal Joseph W. Tobin heads off to shepherd the Archdiocese of Newark in New Jersey, his coat of arms will change—with his elevation to cardinal, it would have changed even if he had not been reassigned to a different archdiocese. In this article, The Criterion takes a look at Cardinal Tobin’s new coat of arms, translating the story the symbols tell about who he is and what he values. The first piece of the story comes from outside the shield, starting with the color of the hat (galero) and the tassels. 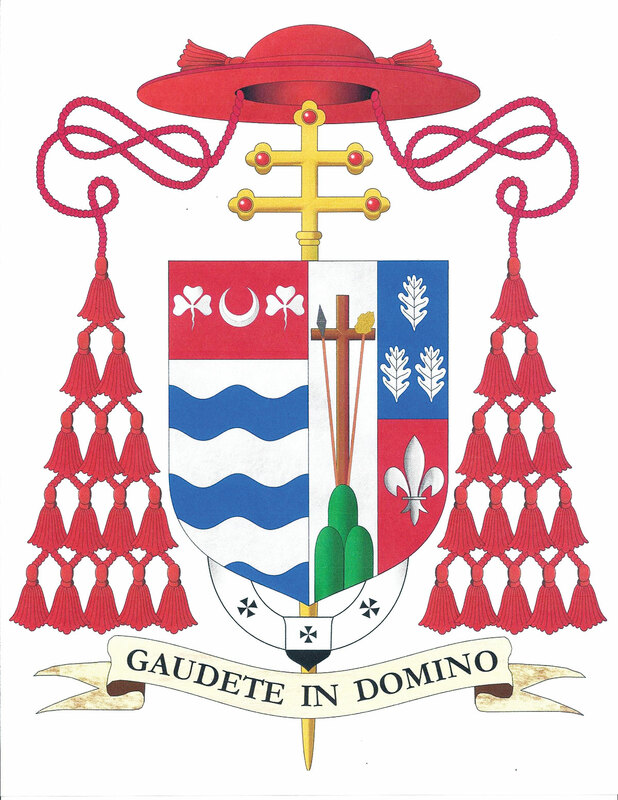 The scarlet hue identifies the ecclesial leader as a cardinal, whereas green, the color used on Cardinal Tobin’s former coat of arms, indicates a bishop. The galero, or hat, above the shield is reminiscent of broad-rimmed, tasseled hats worn by clergy centuries ago. Although its use was eliminated by a papal decree in 1969, the galero is still used on ecclesial coats of arms. The number of tassels indicates the shepherd’s place within Church hierarchy. Ten tassels per side indicate a bishop, and 15 per side indicate a cardinal. Behind the shield is a gold cross, an element reserved to the coat of arms of bishops. A single horizontal bar denotes a bishop, whereas two bars indicate an archbishop. The five red jewels symbolize the five wounds of Christ on the cross. The story continues with the many elements emblazoned on the shield of the coat of arms. The right side of the shield contains the archdiocesan crest. The crest on the left is the personal crest of the individual bishop. That crest would be the same for Cardinal Tobin regardless of the archdiocese he shepherds. Cardinal Tobin’s crest is a tri-part plethora of meaning. Closest to the center of the shield is a cross perched between a spear and a mounted sponge, all reminiscent of elements of Christ’s crucifixion, as are the three green mounds which represent Golgotha. According to the Archdiocese of Indianapolis’ website, the green hue indicates the virtue of hope, while the silver background symbolizes transparency, justice and truth. These figures come from the coat of arms of the Redemptorists, the religious order in which Cardinal Tobin was ordained. Comprising the upper left of the cardinal’s crest are three oak leaves, which come from the Tobin family crest. In traditional heraldry, oak leaves represent strength. For Cardinal Tobin, this symbol identifies the virtue of strength so necessary to following the word of God to obtain salvation at the end of our pilgrimage on Earth. The blue background symbolizes separation from the worldly values and the ascent of the soul toward God. 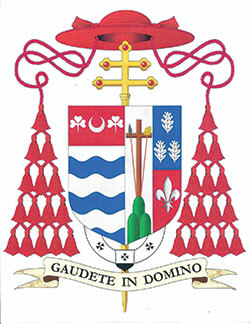 The final component of Cardinal Tobin’s crest is the fleur de lis, a classical symbol of the iconography of St. Joseph, for whom the cardinal is named. It rests on a field of red, a color symbolic of the love of the Father who sent the Son, and the blood the Son shed for the salvation of souls. According to the website of the Archdiocese of Newark, their crest, depicted on the left side of the shield, is “based on the coat of arms of Newark, Nottinghamshire, England, to reflect the origins of the name of the See City.” Two portions comprise the crest. Though the smaller of the two portions, the upper part holds the greater amount of symbolism. In the center is a silver crescent to honor the Blessed Virgin Mary in her title of the Immaculate Conception, patroness of the archdiocese, the United States of America and the major seminary of the Archdiocese of Newark. The crescent is a symbol of Mary derived from the Book of Revelation: “And a great sign appeared in heaven: a woman clothed with the sun, and the moon under her feet, and on her head a crown of 12 stars” (Rv 12:1). The silver or white color represents purity. The crescent sits between two silver trefoils, also known as “heraldic shamrocks,” which honor St. Patrick, for whom the archdiocese’s St. Patrick Pro-Cathedral is named. Finally, the crescent and trefoils rest on a field of red signifying the blood coming forth from Christ’s Sacred Heart, the title of the Cathedral-Basilica of Newark. The bottom portion of the Archdiocese of Newark’s crest contains wavy blue and white lines representing water, which figures prominently in both the English and American Newarks—the city of Newark in England is located on the River Trent, and the Archdiocese of Newark in New Jersey is crossed by the Hackensack, Hudson, Passaic, Rahway, Raritan and Saddle rivers. Below the shield lie the final components of Cardinal Tobin’s new coat of arms, elements that remain unchanged from his former coat of arms. First is the pallium, the white woolen cloth worn around the neck over the shoulders—as a sheep carried by Christ, the Good Shepherd—that yokes an archbishop to the pope in shepherding the flock of the universal Church. Both the physical pallium and the element on the coat of arms bear black crosses and black silk at the end of a tab attached to the front of the pallium. The final message of the story told by the cardinal’s coat of arms is written in Latin on the banner at the bottom. It is the Scripture passage Cardinal Tobin chose to adopt as his motto as a bishop, and will remain his motto no matter where he shepherds: “Gaudete in Domino,” or “Rejoice in the Lord.” It is the statement found in St. Paul’s Epistle to the Philippans, “Rejoice in the Lord always; again I will say, rejoice!” (Phil 4:4).